An encounter with a tall, traditional-looking Native American epitomized a blending of osteopathic and Lakota healing. Reese Beisser, A.J. Olson, and Dr. Cerumuga treated the man, who was still wearing headdress and ankle adornment for dancing. A big man in his late twenties, he complained of a rapid heart beat that occurred erratically, coming so suddenly and strongly when he was driving that he had to stop his car. At other times, his rapidly beating heart had awakened him around 4 am. Previously he had undergone an EKG that was read as normal. As the man lay on the padded table under a portable canvas canopy supported by poles, Reese provided OMT, including pelvic rotation. Dr. Cerumuga talked about the value of yoga postures to release restrictions in chest movement. In his back pocket, the man carried his wallet, as well as a concealed weapon. Habitually, he reached back for his wallet and favored one hip to accommodate the weapon perched on the other side. Such habits could shape posture, bone structure, and pelvic rotation, he was advised. The man was also advised to consult his physician about a heart monitor to measure his heartbeat over a longer period of time than an EKG measures. As he was leaving, the man said his whole body was working better. Discussing his case later, medical students talked with preceptor Dr. Phil Sullivan, MD, about the possibility of Supra Ventricular Tachycardia. Another patient asked A.J. about OMT, and in turn she explained Lakota healing practices, such as blowing smoke into ears. Her blood sugar and cholesterol levels were checked. She gave a history of kidney cancer, which doctors had found when they operated in the wake of a ruptured appendix. The woman was fortunate, since renal carcinoma is diffificult to detect and is dubbed “a silent killer,” A.J. and a fellow medical student later noted. “Cool” healthy snacks, not sugary cola—and can you hear your breakfast? Amanda would like to work with Zoe and other RVU students when they return to Porcupine next May for a wellness event at the school. Classroom talks and show-and-tell about stethoscopes and other instruments in a doctor bag might engage young persons. How to pursue opportunities to become a doctor, a nurse, PA, or MA would be explained. Amanda has worked as a volunteer in Gypsum, Colorado, in a camp for kids who are “really sick.” She observed that doctors at the camp “loved to see kids in a normal setting, not a crisis.” In other educational settings, Zoe has seen middle schoolers thrill to hands-on experiences such as donning gloves and holding a sheep’s heart, or listening to their own hearts. Near the RVU booth, Annie Szmanda showed two ll-year-old girls her rubber percussion hammer, as well as how and why reflexes work. A former gymnast, she taught the two girls how to extend the spine, and she braced them as they moved from standing into deeper backbending. 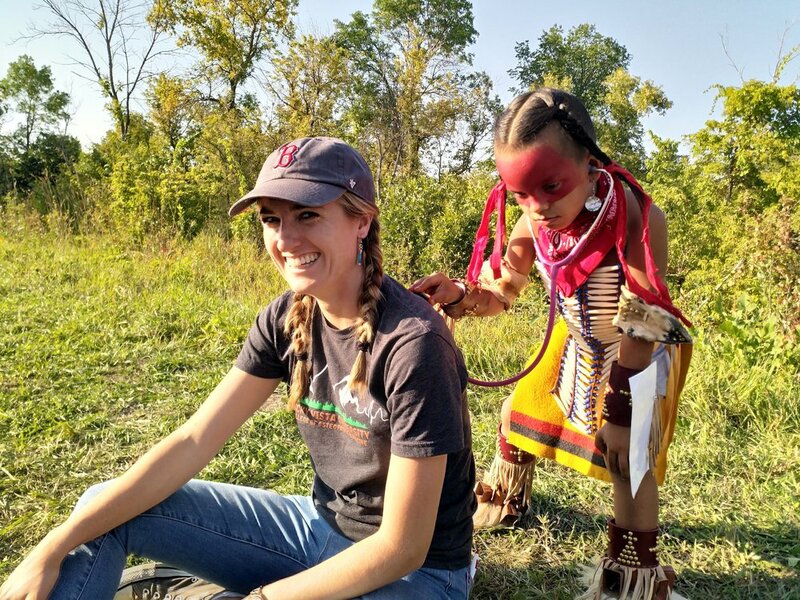 In turn, they taught her about the significance of certain Lakota dances and face paint. Annie also learned how to write a few letters of the Lakota alphabet. Sarah Pederson saw a woman in her early 20s who had multiple complaints—in fact, a review of systems indicated low blood pressure, hypothyroidism, and a recent diagnosis of ADHD. Sarah advised her about hypothyroidism and related weight changes, the significance of ADHD, and signs to heed related to low blood pressure. Although Sarah noticed scars on the woman’s wrist from cutting, this wasn’t discussed because the patient had to leave early. 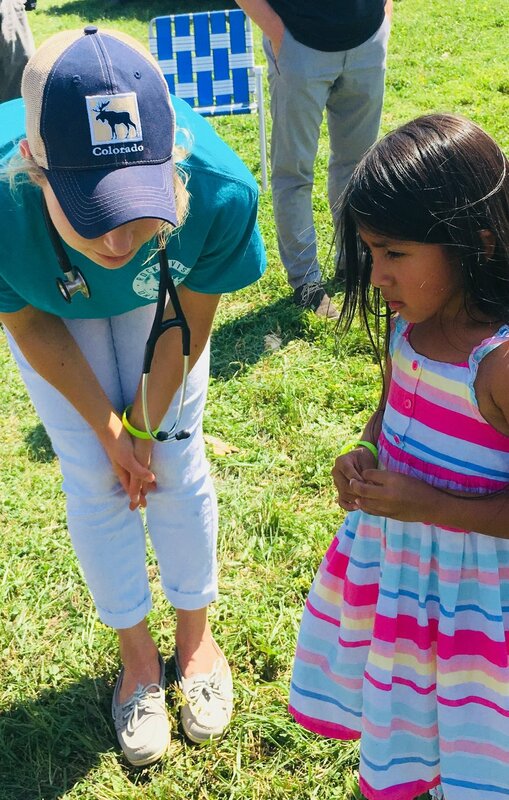 Sara also saw a child with a nose bleed, and Dr. Sullivan showed her how to treat it, noting that 90 percent of nose bleeds can be stopped by pinching the anterior portion of the nose distal to the nasal bones. 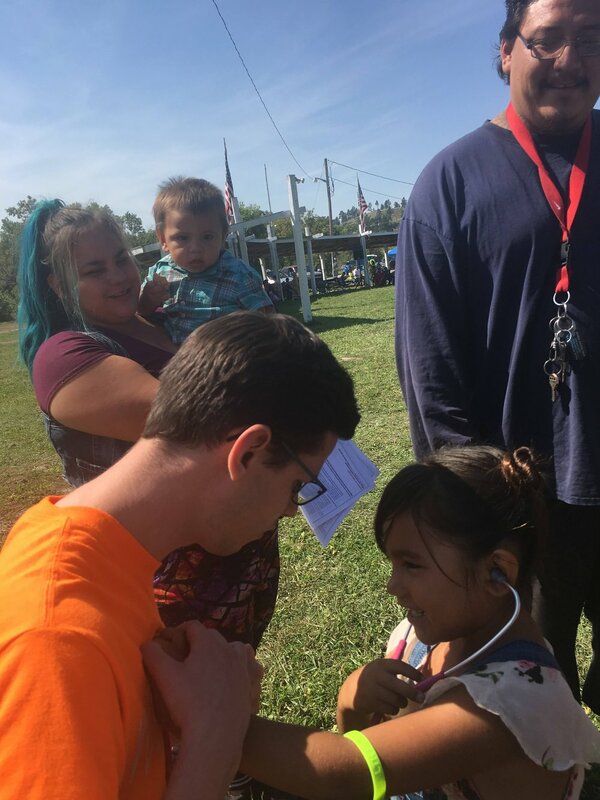 Sarah helped her fellow medical students administer a survey that she and two other RVU students, Austen Anderson and Krysta Sutyak, had designed at the behest of Dr. Camille Bentley, DO, Global Medical Track and Medical Outreach Professor of Primary Care. The survey asks how RVU can best supplement ongoing healing services, notably Indian Health Services and Native American healers. Anonymity and privacy are important to the validity of the survey, Sarah noted, because of questions such as use of alcohol, which is illegal to possess or consume on the reservation. Results from the 20 completed surveys will be used to design the RVU second Health and Wellness Fair on May 3-5, 2019, at Porcupine School. Theodore Schultz, a mechanical engineer, worked as a volunteer at the RVU booth. Recently he had moved from Germany to live with his spouse, medical student Sarah Pederson. Theo appreciated the many cultural exchanges that he witnessed among RVU students and Lakotas. It was a rare opportunity to “enter into an experience where it is not important to know what’s going to happen next,” Theo said. Instead, it becomes a chance to watch and to “reflect on what you see. Playful kids act as bridges to parents. One 5-year-old girl “adopted us all,” Zoe said. During a break, the girl sat on the grass with Zoe, asked to hold her cell phone, and fended off her 6-year-old brother as he swooped toward her. The boy turned into a mischievous brother who wrestled his sister for the cell, which Zoe managed to retrieve as she drew the young girl back into her lap. Yet a few hours earlier his rhythmic dancing had mesmerized her. The chief told a legendary story to explain how a child receives her/his name. The wind carries the name of the newborn, and a man on horseback leans into the wind and listens. When he hears the name, he announces it, and then rides back to tell the ancestors. One day the rider will return bringing with him another horse. The one whose name had been declared at birth will mount the other horse to return to the spirit world to join the ancestors. Between birth and death, one is expected to live up to the name, what it implies, what it means. 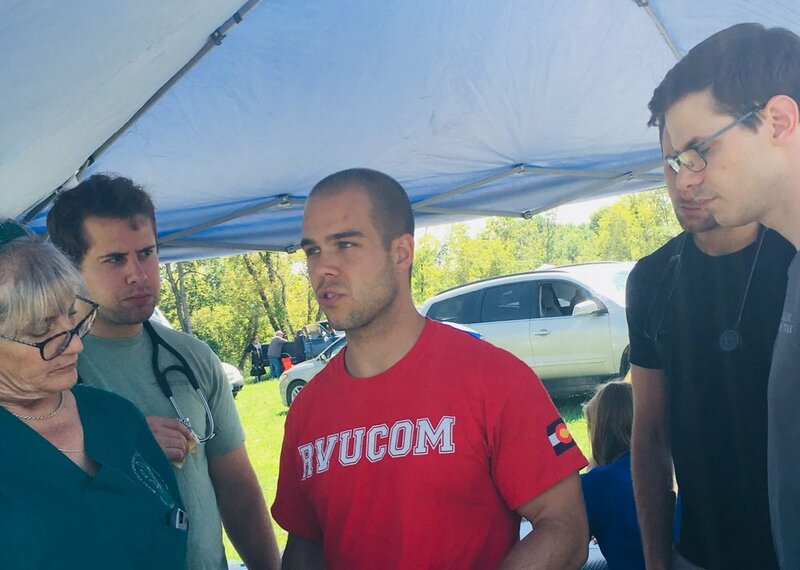 These RVU medical students are becoming Doctors of Osteopathy. As they earn that name, they are learning to live up to the tenets of their professional name, and to draw on and contribute to its wisdom . View Full Image Gallery From the Powwow! © 2017 Hands for Health, Inc.